broccoli quiche, originally uploaded by All Things Mimi. I love broccoli and I love quiche. I love them even more together. 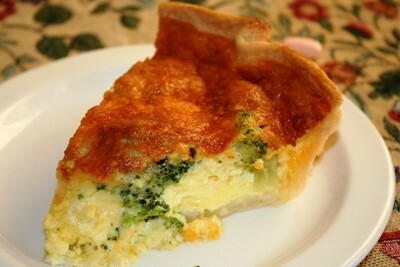 I have made this quiche at least a thousand times (with several variations). I use frozen broccoli, whatever cheese I have left in the fridge (this time it was a bit of cheddar, pepper jack and romano), and my basic quiche base (2 cups cream, 4 eggs, hot sauce, nutmeg, salt and pepper). I like this because it is so versatile. We ate it for dinner Thursday night, lunch on Friday and breakfast this morning.